1. iPads, Apps, and a 4 year old: My natural response to hearing a 4 year old say, “Daddy, can you plug in the iPad to the laptop and load the Dora app from iTunes again – I accidently deleted it,” is confusion, silence and obedient action. In that order. 2. 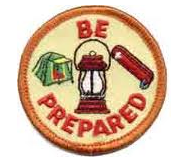 Always be prepared: My boss and I met with a group from another organization today and I was reminded of a lesson from the Boy Scout handbook. She had put in several hours prep work for a brief meeting aimed at discussing a new project. The other group had put in zero prep, likely expecting to participate in exploratory discussions before really launching things in the next meeting. Her work – basically a draft project charter – set the course for the meeting, helped bring everyone onside quickly, and put us off and running in the direction we want. The work will ultimately be a collaborative partnership so the time spent up front may or may not help us end up in a better place in the end, but there is no question that it will help us get there through a more efficient process. 1. The concept of the PVR is lost on my dad. This is despite the fact he owned one before me. Me (immediately upon Dad’s arrival): Don’t tell me what happens in the hockey game, I PVR’d it. Dad: You’re going to want to watch the first period, and then not much else until the shootout. The lesson saved me a couple hours I guess. 2. Story time works with Angry Birds: In an attempt to mix things up, story time with my daughter has recently involved a fictional monkey (which she appropriately named Parakeet) and his travels around the world, supplemented by photos from google images of different cities viewed on our Ipad. Inventive I thought, but admittedly I just wasn’t up for it tonight. Fighting a bit of a cold my creativity was waning, but I figured out a way to deal with it. Story time tonight involved a gang of very angry birds who were intent on knocking over bad-guy pigs. Why? Well, the pigs had eaten all their birdseed of course. She seemed to enjoy it, and in the meantime I passed 5 more levels so I am calling it a win-win. I now have an idea for tomorrow too – an alligator that is sad because he want a bath, but he can’t find the water! 1. I’ll never go to the bathroom alone again: My problems in the bathroom are officially solved. No more awkward balancing of the laptop on my knees. All logistical problems have been flushed away. Now that we have an iPad I really can’t imagine going to the bathroom alone again. The only problem that might come up now is getting me out of there. 2. It is never good when your daughter says: “Daddy, you’ll never find your keys!” Today our pleasant little four year old was laughing and laughing while I madly searched the house for the my keys. A fun game, apparently.